Hospitality Management Holdings (HMH) is showcasing its key opening with the Coral Al Madina Hotel in Saudi Arabia leading the pack at the ongoing Arabian Travel Market 2015 in Dubai, UAE. Featuring 400 plus rooms and suites and spread over 10 floors and five basements, the hotel is its final stages of development, said a estaminet. It is owned by Mobarak Hotels Group that has appointed Designs Company, specialised in providing integrated hotel solutions, to overseen their growth and expansion, it said. Laurent A Voivenel, chief executive officer of HMH, said: “We are proud to present Coral Al Madina Hotel to the global travel trade. It is going to be the biggest and most prestigious opening of the year for us and ATM is the perfect platform to introduce it to key players in the industry. 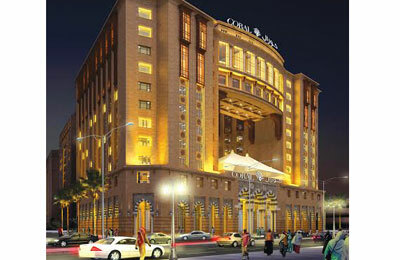 “Each room at Coral Al Madina Hotel is thoughtfully equipped to meet the needs of Hajj and Umrah pilgrims and families. Included in the hotel’s wide range of facilities are three specialty restaurants and a lobby lounge, two state-of-the-art meeting rooms with adaptable function spaces, business center, fully-equipped gym and spa, shopping arcade, large private parking as well as helicopter landing site,” said Voivenel. According to industry reports, the tourism sector in Saudi Arabia heavily relies on religious tourism. Inbound tourism expenditure reached SR58.5 billion ($15.6 billion) in 2013, compared to SR41.6 billion ($11.1 billion) from domestic travel in the same year. The growing domestic and international tourist volumes are driving demand for quality accommodations in the country. Therefore, Saudi Arabia has seen a massive increase in investment in the hotel market. HMH began operations in the kingdom with Coral Al Khobar Hotel eight years ago followed by expansion in Riyadh, Jubail, Al Ahsa and Madinah. “Saudi Arabia is a key growth market for us. Riyadh, Jeddah and Madina are the hubs of hotel investment in the country due to the high demand in the cities,” said Voivenel.